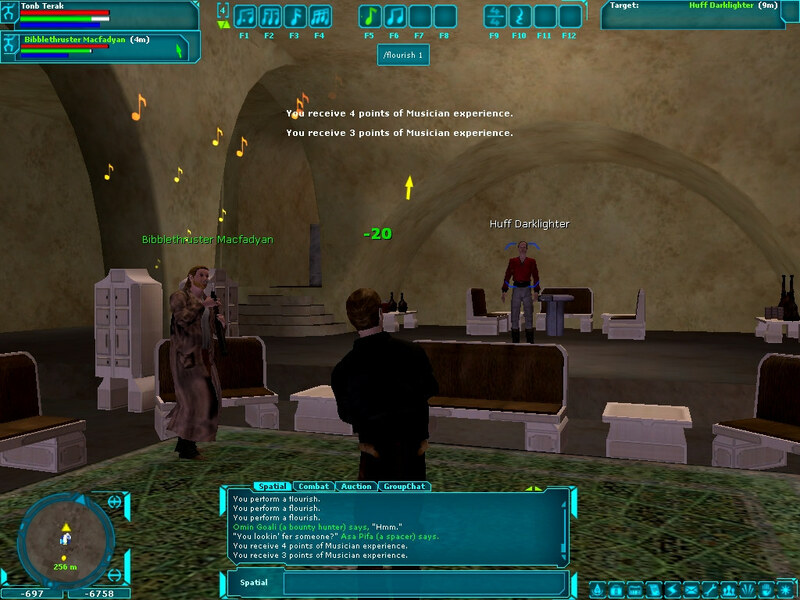 Adam J Purcell relays how it is in the world of the Massively Multiplayer Online Game: Star Wars Galaxies. 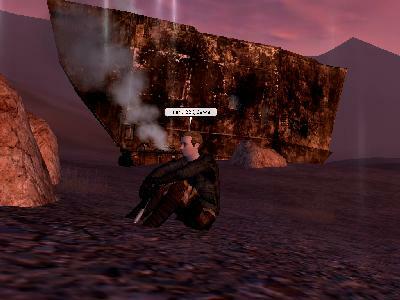 So started my new career on that wretched skive of hum and villainy known as Tatooine. And did it hum! The stench of death hung in the still air like a petrified dewback corpse on a repulselift slab. Only 500 credits in my pocket and a name to make I set off to the local speak easy to get the skinny on local events. The local broads weren't talking a language I understood and the more drinks we had the less we all cared about business. I gave them my generous tip and left. One thing was for sure - I needed to learn several new lingoes to get by in this town. Now, all but broke, I went in search of a language teacher. Rumour had it that several inhabitants of the festering Mos Eisley would cut a deal a squeal me a language or two. These people wanted experience, and plenty of it. Who was I to deny them? Besides these unregistered trainers usually do you for free whereas the lifeless professional trainers usually charged a Moff's ransom, well, at least a 1000 big ones. With the twin suns about to scarper over the horizon time was scarce. Even after my short time here I was fed up of sleeping in the gutter. Before I told myself that I could afford some dingy grim hole of a hotel room for the night, even if I was reluctant to actually splash away what little moula I had. No, this time I had no choice. I cursed myself for my weakness with exotic femme fatales. I had no choice, I had to forgo the language training for one night and instead raise some dough, and raise it the hard way. Failing to sell a single 'Big Issue' it was the welcoming embrace of the rancid space port lounge for me that night. Fortunately the Imperial Stormtrooper who threw me out of there three days ago was earlier that day blown away by a rebel sympathiser. I made a mental note never to trust Stormtrooper armour, it couldn't stop a paper dart from a crazed origamist. And I've met quite a few crazed origamists in my time. I woke up with that rancid taste you get in your mouth after a night slumming it, the kind of taste that reminds you of that time a Jawa used your mouth as a latrine. There was something far worse waiting for me as I regained consciousness this morning, though. Astromech chatter. Yes, that damned green R2 unit was back and, unfortunately, his was one language I could understand. Upon arriving on Tatooine all those days ago I was almost immediately accosted by this green critter. He wanted to help me and wouldn't take no for an answer. I'd give him the slip but it was only a matter of time before he reappeared with his cursed suggestions on how I can improve my skills. One thing he hadn't told me was that his mysterious master was a philanthropic type who gave small but much needed monetary rewards for following the instructions of this droid. I soon discovered this was the case when I took the astro-droid up on his first suggestion. 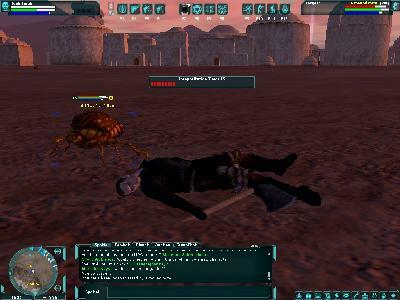 Taking on a mound mite on the outskirts of Mos Eisley sounded like a good idea. Certainly I was in the mood to kill something and I'd daren't risk the wrath of the green droid's master. Trying to snub out the mite with an axe turned out to be more difficult than expected. The blade cut through the thick hot air like a knife through durasteel and the first swing had almost worn me out. Before I knew what had hit me the good-for-nothing bug had me at his mercy and dropped me like a cheap floozy. With a mouth full of tatooian grit sand I came to in one piece, though feeling like a right patsy for the unhelpful green droid. That was enough of trying to improve my brawling skill for one morning - I pulled out my special issue pistol and filled the mound mite full of laser bolts. That's the last time he would make me look a fool. 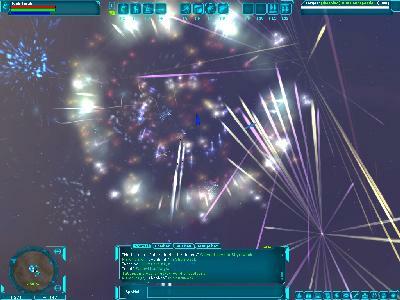 Good fortune was, for once, on my side and the green droid appeared to enjoy the spectacle of battle. Apparently my blaster skills had improved enough for him to authorise a little payment for my efforts. A couple of hundred credits was good. Even better was the award of a free rental speeder-bike. Finally I could escape the cesspool of Mos Eisley and take a look at the surrounding sites. Not so far outside the town was an burnt-out old Jawa Sand Crawler. Still smoldering gently in the early morning breeze it reminded me of that suspicious house fire I was investigated as a boy. This one smelled different, though, rather than pork it was more like chicken. I dunno what those Jawa's must have tasted like but they sure did smell good. A good deal better than when they're alive, that's for sure. Looking at the sloppy blaster burns around the massive vehicle I guessed it must have been Imperial Stormtroopers - only they are so imprecise. It was obviously a good few weeks ago, however, even if the craft was still smoking like an old Hutt funeral pyre. I quickly left the area before I became tempted to gnaw at the pile of charcoaled bones off to one side. Further into the Jundland Wastes and I stumble across an abandoned escape pod. Not that I believe in any hokey religions but for some reason I got the inexplicable urge to say "Look sir, droids!". 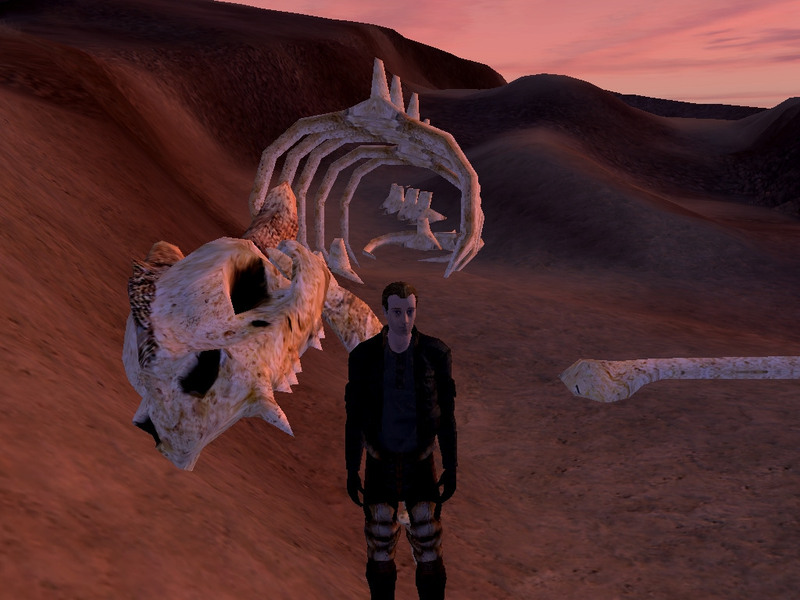 A good few miles further way I ran across the gleaming bones of an ancient Krayt Dragon. Fortunately I didn't encounter any live ones, I hear their fire can put you on ice permanently! 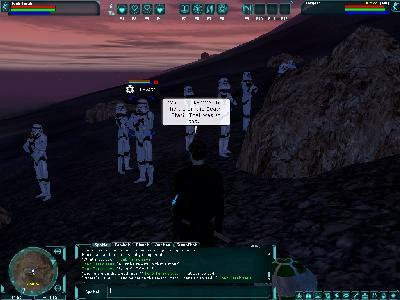 After the welcome sunset I ran into a squad of Stormtroopers but they didn't seem in the mood to give me the word on the street. There is a surprising amount of Imperial activity on Tatooine, more than I would expect from such a backwater. Ever since that Death Star of theirs blew up they've all been on edge. What little in the way of my taxes paid for that space station - I'm all for getting value for money but you've got to wonder about the concept of least cost contracts. If the Emperor can't protect his exhaust port then this galaxy is buggered. That's my view, anyway. Luckily the Stormtroopers ignored by heatstroke addled comments and I left them to skulk in the desert. 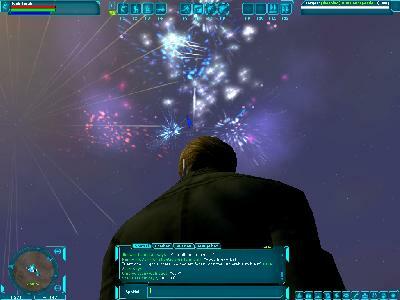 Fireworks in the distance caught my attention so I jumped my speeder and stepped on it. The call of a firewater caused me to get to the celebration in no time. Apparently some local merchants had band together to open a new 'Mega Mall' in the small town of Jealihmet. A one credit gamble at the celebratory raffle won myself a Gamorrean Battle Axe. Fortunately she was a lot more hospitable than most of the old battle axes I've met, if a little sharper! The green droid reappeared to tell me the obvious - the axe was far too difficult for me to weld at the moment. As it reminded me to practice my brawling skills I wished I could hack the droid's irritatingly green dome off. Instead I stomped off the the local bank and stored the axe in the safety deposit box - someday I will learn how to use it and that droid will be pushing up the daisies! Inside the nearest bar I came across an odd fellow named Bibblethruster Macfadyan. His dirty mac gave a certain impression that wasn't dispelled by the overheard conversation he was having with a slaver about opening up an orphanage. To be fair I don't think he realised he was talking to a slaver but you can never be too sure. 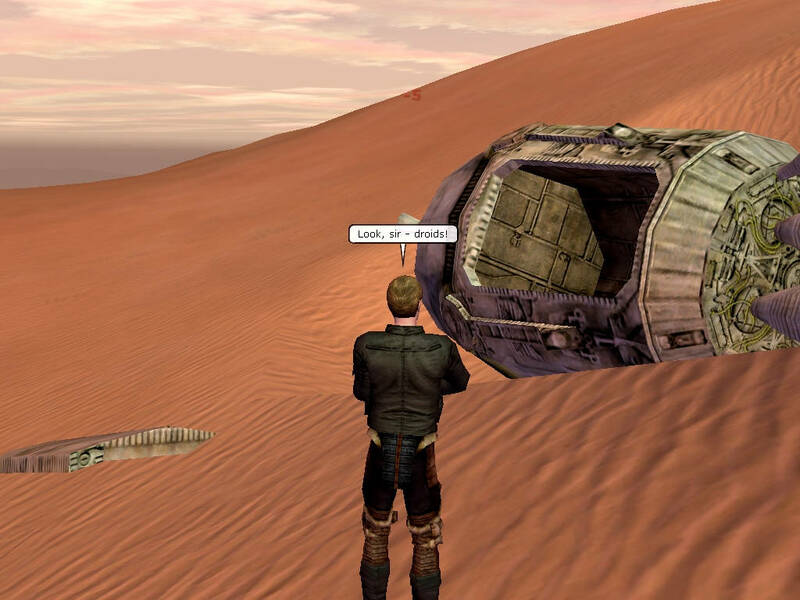 Star Wars Galaxies is a big game. 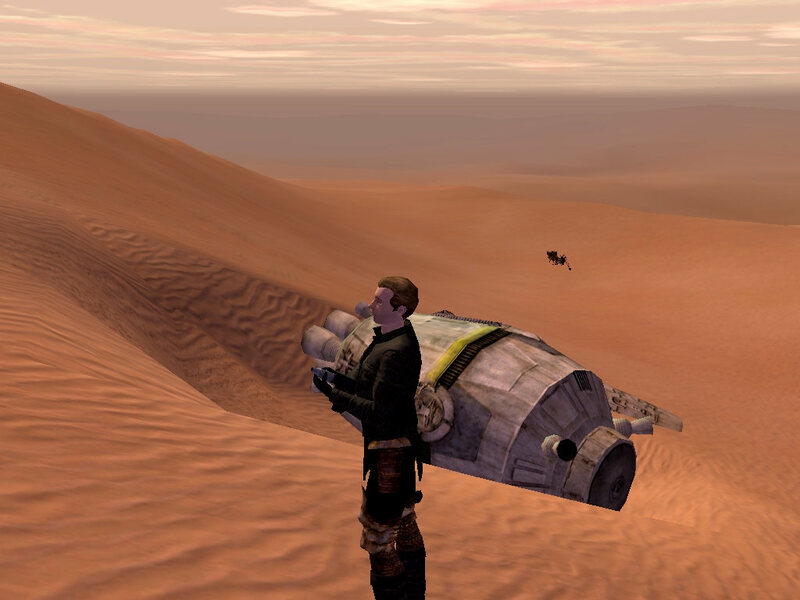 So far we've barely scratched the surface of what's available to do as new players on Tatooine. Ten worlds, a vast combination of possible skills (from combat to artisan, along with politician, entertainer and more). You will not get bored quickly. 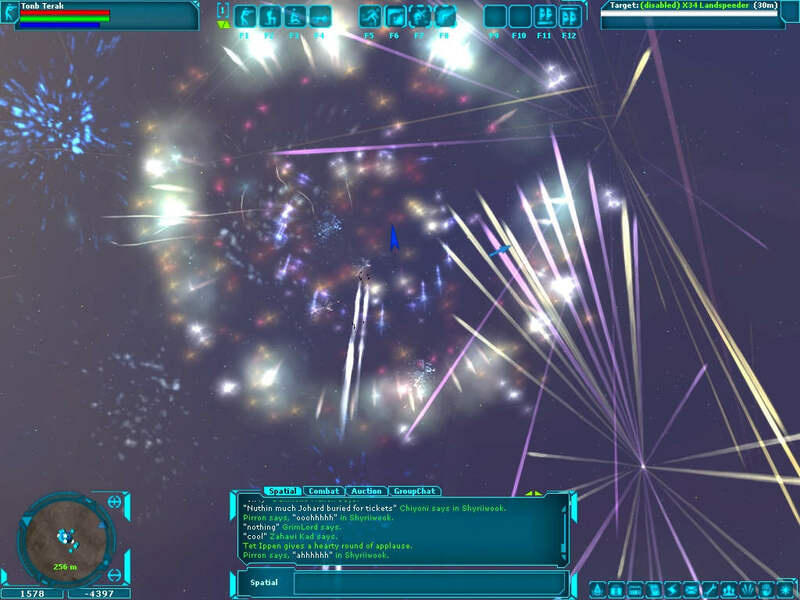 Yes, as a Massively Multiplayer Online Game, there is a monthly fee involved. At its highest, for one month at a time, it is $14.99 (which converted to Sterling with 17.5% VAT equals about £10 a month at the current exchange rates). This pays for their servers, bandwidth, customer support staff and, most importantly, regular 'free' (as in part of the subscription) updates to the game. These updates typically come about once a month, with minor bug fix updates in between where required. Apparently they have over 70 staff constantly working on Star Wars Galaxies to keep it going and constantly adding new content. Is it fun? Incredibly so, especially if you can manage to play with people you know in real life. 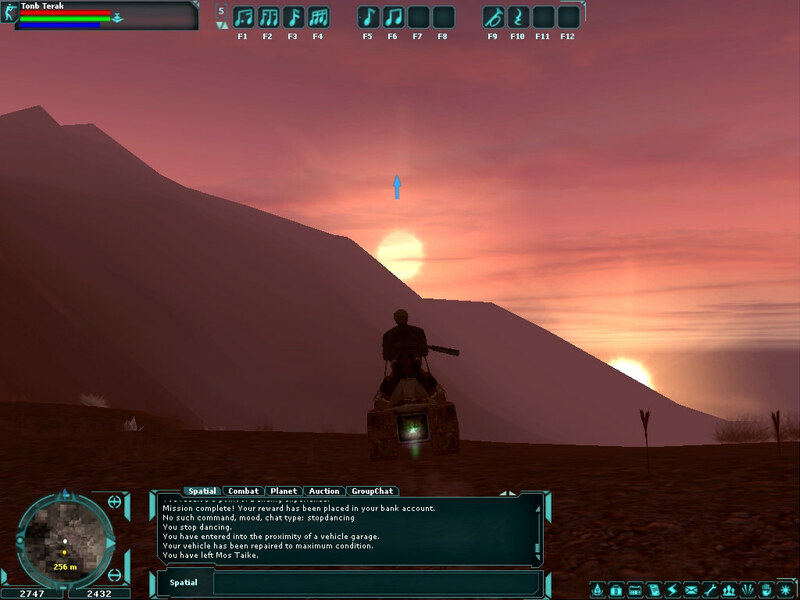 You can play it as a loner but the game really comes into its own when you team up with others to perform the various missions or tasks. There are many who play in almost exclusively in character, using it as a vast Roleplaying world. There are guilds you can join (most align against either the Imperial or Rebel factions and play a part in the ongoing 'Galactic Civil War' where each faction must capture the other side's bases and kill their players). You can even build your own player towns out in the open worlds. For us this is all in the future. We have basically started out as a small combat group and perform missions to kill lesser creatures and destroy their lairs. This is a way to improve our skills and our chances of surviving the tougher challenges ahead. If combat isn't your thing, however, you can become an artisan and make goods for other players (things ranging from clothes, armour, weapons, droids, vehicles, buildings, etc.) You can even become a politician and run for mayor at a player run town. Myself, I'm aiming toward becoming a Bounty Hunter (of course - along with probably most other new players!) which requires I become a Master Marksman and gain some high level Scout skills. Really the best I can suggest is for you to give it a try. Ideally you need a broadband connection, not so much for playing the game but more for the regular (and very large) updates that are downloaded to your machine. Currently there is a free 14 day trial at www.gamespot.com, available until the end of August 2004. Get your skates on, it's well worth it (and you don't need to give any credit card details to play the trial). It's PC only, I'm afraid, but it does work well under Linux via Transgaming's Cegeda as well as its native Windows 98/ME/2000/XP. If you do want to give it a try then please contact us in-game, we'd love to team up with you for a bit and show you the ropes. You can contact me in game by sending a game internal email (the envelop icon in the bottom right toolbar) to 'Tonb Terak'. Don't forget to sign up with the server 'Chimaera' or you won't be able to find us! 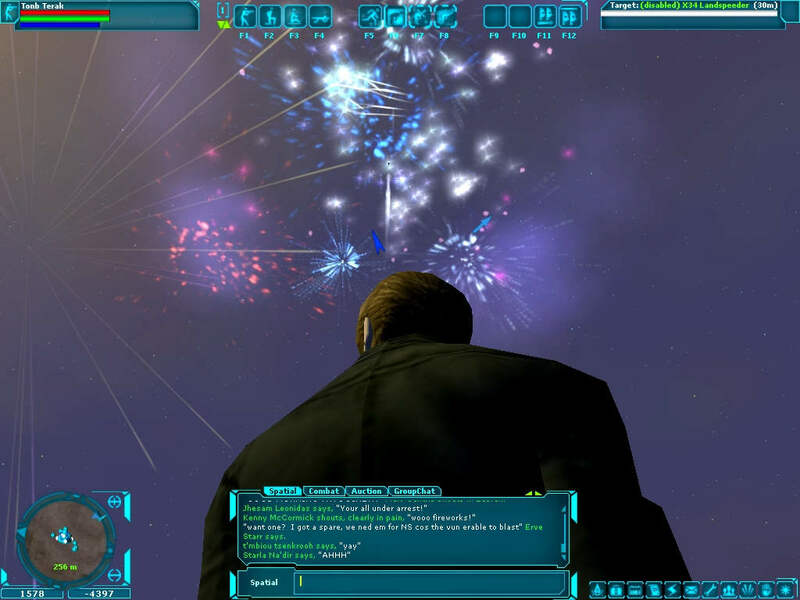 For more useful information on Star Wars Galaxies than I've just given visit the official web site at www.starwarsgalaxies.com. We look forward to seeing you in a galaxy far, far away!